Apps in Bring Your Own Device scenarios are difficult to handle. The according devices are often not under control of a device management system, nevertheless there is a high need to remotely configure those enterprise apps, update or change their configuration or even selectively enable or lock them for specific devices. Furthermore, apps often have to be switched between different environments, like production environments, training environments, or test environments. 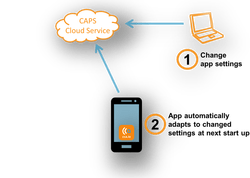 ​ CAPS (Critical Application Platform Services) is a lean, multi-customer cloud service that focuses exactly on these needs. CAPS is available not only for CCA developed apps, but for 3rd party apps as well. Via a Web App, a configuration for a certain environment is defined. The app can be easily attached to this configuration by scanning an associated QR code or tapping a configuration link. Also default configurations are supported. Updating the configuration is done completely transparently for the user since the app automatically retrieves new revisions of a configuration. 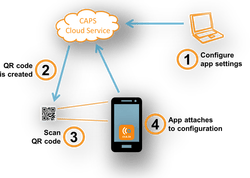 CAPS always knows the current configuration and revision of the app on each device, allowing you to track the status on all devices. An app can be switched to a different configuration by simply scanning a different configuration QR code or configuration link. Alternatively, the app on a certain device can be actively pushed to switch to a different configuration. 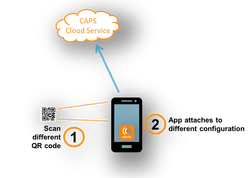 CAPS provides a plentitude of additional features like distribution of apps, disabling them on certain devices, or monitoring the number of active app instances. Last but not least a convincing argument might simply be the reasonable pricing compared to the enormous costs of typical device management systems. This innovative service proves again CCA’s competence in mobile services for mission-critical environments. Like it! Share it! Follow us on LinkedIn or Xing! Contact sales@cca.io for more information.